How would you like to earn Hostess Benefits on an order that is less than $150.00? I know things are hard for so many people these days, but you still want to get the newest Stampin' Up! goodies. If you place an order of at least $25.00 (before taxes and shipping) in my online store now (August 27, 2013) through September 15, 2013, you will be entered into a drawing to win the Hostess Benefits. (Total Promotion orders must total minimum $150.00 to qualify for Hostess Benefits.) Get together with your friends and check out the online catalogs. There are lots of new and wonderful items in the 2013 - 2014 Annual Catalog and the Holiday Catalog just came out recently. Also, remember, a purchase of $25.00 (before taxes and shipping) counts on my Frequent Buyers Rewards Program. Be sure to check out how to get free Stampin' Up! products that way too. If you want to place an order for $150.00 or more (before taxes and shipping), please don't use the Hostess Code. You can place your order normally and collect Hostess Goodies immediately without having to wait. 1. Place an order of $25 or more (before taxes and shipping) in my online store. 2. 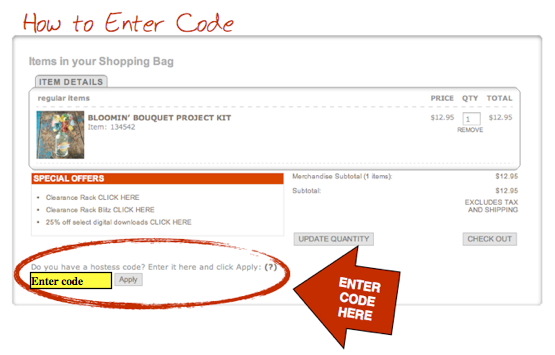 Make sure you have selected me as your demonstrator for the code to work. (Click the Shop With Me link to the left to go directly to my online store. If for some reason it doesn't you have to select me, Rhonda Price). 3. You have to enter the Hostess Code 6Q3Q2YD9 when you order. I CANNOT go back and add it for you if you forget. 4. On September 16, 2013, I will enter all the names on Random.org and a winner will be selected. I will post the winner here on my blog, on my Facebook page, and I will contact the winner by email. Labels: Frequent Buyer Rewards Program, Hostess Code, Stampin' Up!